The Riverhead Foundation for Marine Research and Preservation, which often assists local authorities in cases of stranded animals, wildlife recovery and wildlife rehabilitation, was called yesterday afternoon to examine the carcass and make an assessment. According to a biologist, the whale appears to have been decapitated by a large boat propeller. The whale was an adult female and showed signs of multiple propeller wounds. Whales are no strangers to boat propellers. Larger whales are often too slow to move out of the way in time, and human noise can make it difficult for whales to hear boat propellers soon enough. More than anything, because whales rarely encounter natural predators, it’s not in their nature to reflexively avoid large objects like ships. Whales are a somewhat frequent sight off the coasts of New York in the summer, often spotted off the shores of Long Island or the Rockaways. 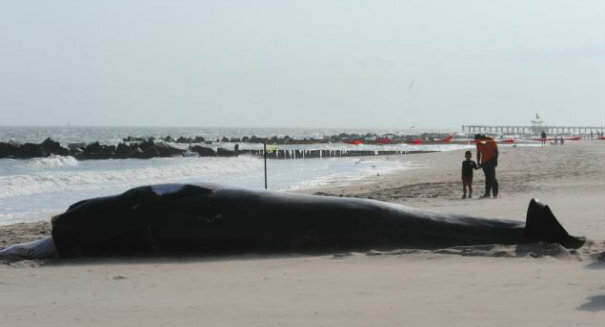 The last dead whale was found last year, floating in New York Harbor.